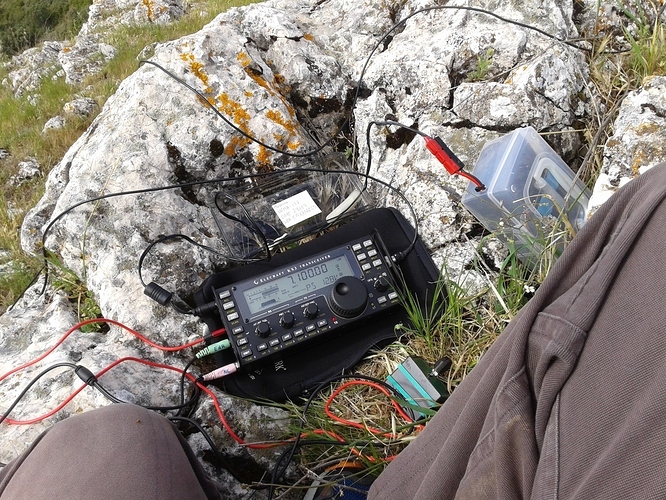 My friend Jorge, EA2LU, who is preparing his portable setup to do more SOTA activation, has receintly purchased a 4S cell 3 Amp LiPo battery (14,8 V nominal, 16,8V max charged) and we decided to do a joint activation to test it. When the battery is charged to max voltage (16,8V) it is too high for the rated voltage in our portable transceivers. Most standard rigs have an acceptable deviation of 13,8 ±15%, that is max 15,9 volts. Jorge prepared a voltage reducer composed of 3 diodes P600 connected in series with the battery. He added a bypass switch so that the diodes can be skipped once the voltage drops to a safe value. Final voltage: 15,3 Volts (1,5 volts drop). The diodes were all the time on to reduce the voltage to a safe value for the transceiver. The reduction with diodes is 2,3 Volts, therefore the max voltage provided with diodes is 14,5 volt, which fits in the acceptance range. Conclusion: After 1h 35 minutes the diodes stayed connected and the voltage was still good (13 volts on the TRX). Therefore much longer activations could be carried out with this battery on summits. Pass Setoain and keep straight until 42°53’23.6"N 1°30’21.5"W (42.889897, -1.505975) where a dirty road starts at right hand side. Park there and start the climb. (GPS track is uploaded in the SOTA Mapping web page). It is an easy trail that follows a wide dirty road for most part of it and in the last hundred meters it is a mountain path. Trail passes a thick pine tree and bleech forest thus making it recommendable for hot summer days. Date, Saturday 5th August 2017. EA2LU’s station: KX3 @10 watt. multiband EFHW with traps for auto band change. EA2BD’s station: FT-817 @5 watt. EFHW. The summit is not large and soon bends into the forest. Therefore we couldn’t separate both antennas much. Mutual interference was strong. I decided to activate briefly in 20m SSB only meanwhile Jorge did a longer run in CW, between 7 up to 28 MHz, to test his battery extensively. Incoming signals were not very strong and suffered from QSB, but we could log a lot of chasers, as usual on Saturdays. We both enjoyed the day. It is a pleasure to have a walk on the countryside, test homebrew devices and share our hobby. Anyone using HRB LiPo batteries ? Nice activation with the mountain goats! Just a quick thought about using LiPos with the KX3 from my limited experience (I usually use 4S LiFePO4, but have recently started playing with 3S LiPos due to lower weight and cost, in spite of the higher fire risk and lower number of cycles). With recent firmware, the KX3 can output 10 W down to a supply voltage of 10 V (key down). This means that a 3S LiPo is enough (as its voltage will be about 12.5 V when full, then around 11 V for most of the discharge time, finally dropping rapidly down from about 10.8 V near the end). Of course the voltage seen by the KX3 will be lower due to resistance of the cable/connectors, fuse and the ~0.3 V drop across the KX3’s internal reverse polarity protection diode. But you should still be able to use most of a 3S LiPos capacity at 10 W output, have less weight to carry, no hassle with diodes etc. and less heat. In light of that fact, the only advantages I can see in using a 4S LiPo is that you’ll be able to use 15 W output on the KX3, and perhaps get lower transmit IMD – not really relevant at these power levels in my opinion. thanks for your comment, completely agree. If the purpose was to power up a KX3 at 10 watt, a 3S LiPo would be enpugh. If the purpose was to power up a KX3 at 15 watt, the current drain would increase to 2,7 Amp and the 4S LiPo would be a better choice. The 4S would be a good option probably for an FT-857 when running 25 watt (Rx: 1 Amp / Tx: 8 Amp at 25w out). A short activation could be possible using this 3 Ah battery. If we carry out some more tests I’ll let you know. since last year I hardly ever use the 3S2P LiPo I bought when I started SOTA with the KX3. The battery has about 4800 mAh capacity, and I can easily do 4 activations at 15W (mixed CW and SSB), without need for recharging. I have used for years 4S3P Li-Ion reclicated computer (The famous 18650 cells of 2 Amp or more). When my operations are long, or several operations in a day. I also reduce the voltage with two diodes in series (to be in the correct voltage range for the KX3) and fast fuses of safety. If the operation is fast and light, then I take 3S2P. In any case, they have always worked perfectly. Say hello to Jorge, he looks great !!! Thanks Dani, nice setup and info. Jorge is doing well and enjoying a lot!